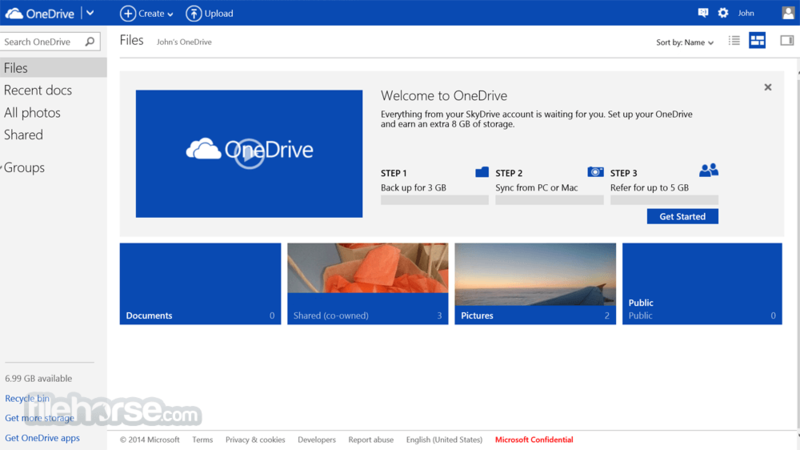 OneDrive (formerly SkyDrive) is online storage service for Windows users built by the core Microsoft Windows team that enables them to easily backup and share their data with their friends, family and business partners. To make this process as easy as humanly possible, Microsoft engineers ask for you only to put data in the newly created OneDrive directory after you install this program. All data from that directory will be automatically and securely transferred to your own storage space on OneDrive.com, where you will be able to access it from any PC, Mac or portable device you own or you have access to. Whenever you change your local or online files (edit, rename or delete), the other location will mimic those changes. This kind of smart and powerful cloud storage is available for everyone for free. Free online storage! One of the most popular and most feature-full online file hosting services comes to us directly from the makers of Windows OS themselves – Microsoft. Their first entrant into the field of online backuping, synchronization, collaboration and online management of files is OneDrive. Built from the ground up to not only be as easy to use as possible but also to have wide suite of tools and features that are perfectly integrated into other online offerings that Microsoft offers with their industry leading Office productivity software, OneDrive aims to represents one of the most integral parts of your Windows OS experience, especially if you are a user that have more than one PC and portable device. Launched in 2007, this app receives countless updates that eventually led to the fully integration of its many features into the Windows 8 operating system for desktop and laptop PCs, Windows Phone OS, an Windows RT for ARM-based portable devices. Microsoft OneDrive (previously also known as Windows Live OneDrive) offers to every user 7 GB of free storage space, and additional 3 GB to students (at one point in time they offered highly popular promotion for 25 GB of free space). In addition to seamless syncing of files between your local device and the cloud, users can access files from their internet browser and immediately start up wide array of Microsoft webapps for document creation, edging and management such as Word, Excel, PowerPoint, and integrated sync with desktop versions of those and many other apps. Control over file sharing is set by privacy settings, which enable you to flag files and directories as private, public or shared. Simply put, if you are already invested into Microsoft’s ecosystem, OneDrive represents a must have app. To better describe to you how feature full OneDrive Free online storage!, let’s just list few of its less known features: integration into Windows Live, Office, email (Outlook.com and Hotmail.com), Bing, sharing on social networks, location and people image tagging, photo slideshows, viewer for PDF files, and even Recycle Bin that will save your deleted files! 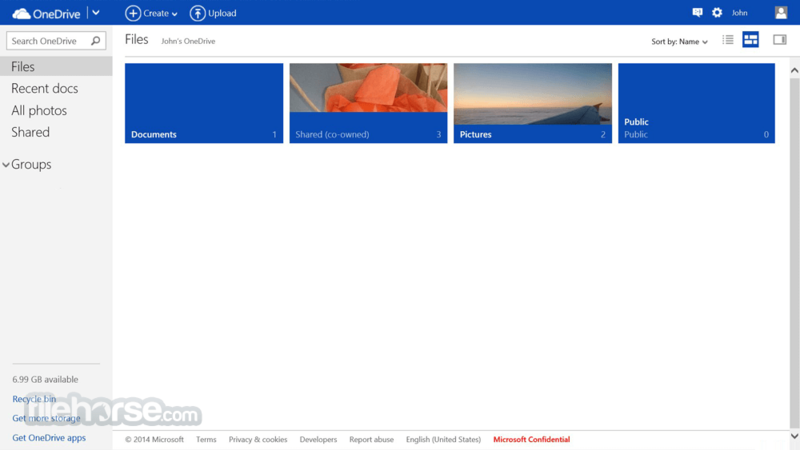 OneDrive interface is aligned to the visual style of the other Microsoft products (icons, layout, graphic style, fonts, menu and tools layout), it’s straightforward, fast, and easy to be used by both novices and longtime users of web apps. You can easily upload, share, edit and manage files located in your OneDrive account without any learning curve. Creating accounts on OneDrive is free, which will grant you 7 GB of free storage space (+ 3 additional gigabytes for students). 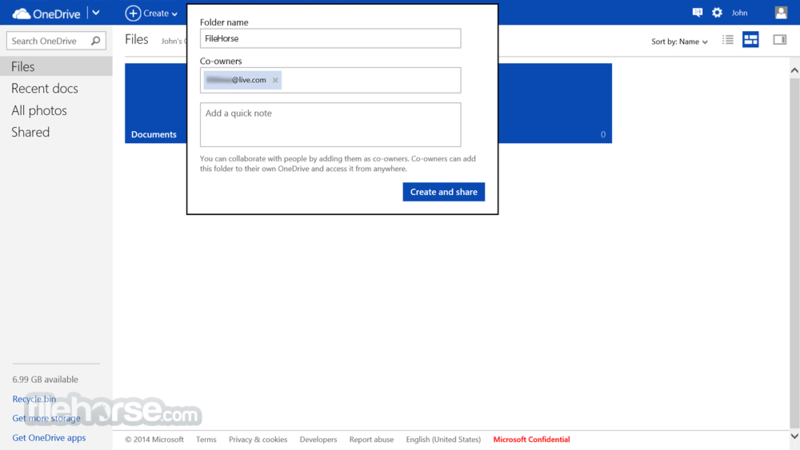 If you are older Windows user, you can access OneDrive already by giving it your Windows Live ID credentials. Creation of new account requires only your name and valid email address. If the initial free space is not enough for your needs, Microsoft offers three additional subscription plans that will give you additional 50, 100 and 200 GB of storage space. Payments can be done either directly via credit card or by PayPal in selected markets. As many Windows users already know, OneDrive is a fully-featured online storage service that can easily hold its ground against strong competition in the like of Dropbox and Google Drive. It doesn’t lack any significant feature, gives user more free space than competition, and also have cheaper subscription plans that give users a lot of additional space. The only downside of OneDrive is its large focus on Windows devices, causing smaller reach on other operating systems that are popular today (most notably Android and iOS). Keep your favorite photos and videos safe, even if something happens to your device. Earn an extra 3 GB of storage when you activate camera roll backup to save photos automatically. It's easy to view them anytime, on any device. Free online storage! Store and share your favorite photos, videos, documents, files, and more on OneDrive. Sign up and get 7 GB of storage, free.